How do I become a Kinesiologist? Where do I learn Kinesiology & how do I become a Registered Practicing Kinesiologist? Congratulations for choosing to find out more about Kinesiology and for contemplating doing a workshop and perhaps reinventing your career! The majority of students chose to do a simple introductory workshop ensuring that Kinesiology is the path they are destined to follow and then move down the Traditional Qualification Pathways of The Institute by fulfilling the qualification requirements and achieving the Associate Diploma/Professional Level set by The Institute. This pathway simply means that as you complete Kinesiology courses accredited by The Institute, you will move from being a Student Member to an Registered Member to ultimately a Registered Professional Member. It is at this level that you are recognised by The Institute, the industry and Health Funds as being an Accredited Practicing Kinesiologist. Another way to become a Kinesiology practitioner is to undertake the Certificate IV in Kinesiology (HLT42807 or HLT42812) and Diploma of Kinesiology (HLT 51507, new: HLT52415) as part of the recent introduction of the Australian Government's Health Training Package (HLT07) for Kinesiology delivered by Registered Training Organizations (RTOs). The Health Training Package ensured that the designing of the curriculum for HLT52415 (and HLT51507) Diploma of Kinesiology meets The Institute's current qualification requirements and stipulated that only those courses accredited with The Institute can be included in the curriculum. The Institute has the overall responsibility to ensure the highest standard is adhered to in order to foster Kinesiology and Kinesiology practitioners. The Institute believes "more" does not necessarily mean "better". It believes that a minimum requirement of 500 face-to-face hours in Kinesiology training will hold students in good stead and considers it sufficient as a starting point to be a practitioner. This model of training provides a good foundation to either specialize in an area of Kinesiology trained in or to expand further afield. This is loosely modeled on osteopathy or chiropractic training. Through the requirement of Continuing Professional Education (20 points), each year Registered Professional Members and levels above are encouraged and have the opportunity to train further in areas of interest. As health care providers working with human bodies, The Institute deems it necessary for extensive studies in anatomy and physiology, nutrition, counselling and practice management as part of a solid qualification training. This is the reason why The Institute has higher Non-Core Kinesiology hour requirements than similar associations such as the AKA or ATMS. 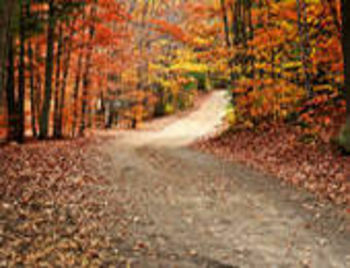 The Health Training Package including HLT42807 or HLT42812 Certificate IV in Kinesiology and HLT51507 Diploma of Kinesiology commenced early 2008 and are being offered by Registered Training Organizations (RTO's) in Australia. The Health Training Package stipulated that the RTOs' curriculum must include courses accredited with a "Peak Industry Body". The Australian Institute of Kinesiologists Ltd (The Institute) is a peak body for Kinesiology. For RTOs to have their qualifications recognised by The Institute they must tailor make their courses to meet the Industry Standards set by The Institute - Peak Body for Kinesiology. Graduates of Diploma of Kinesiology (HLT51507, new: HLT52415) are eligible to join as Registered Professional Members with The Institute provided they have met the qualification standards of The Institute. Registered Professional Membership Level and above are the recognised and accredited practicing kinesiologist level in Australia. 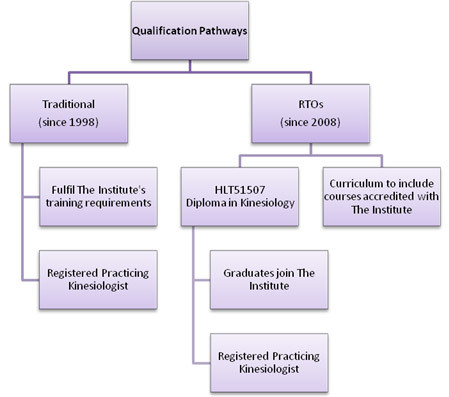 The Institute is aware that some RTOs' Diploma courses are not meeting the qualification requirements of The Institute and therefore their graduates will not be able to join the Australian Institute of Kinesiologists Ltd - the Professional Organisation - upon graduation without further training and education. The Institute meets the requirements of Section 10 of the Private Health Insurance (Accreditation) Rules 2008. Graduates of Diploma in Kinesiology (HLT5150, new: HLT52415) as health care providers providing the Kinesiology treatment must be a member of a Professional Organisation - The Institute.